I’m not likely to ever meet anyone again quite like Mr. Tom Harrison. The Harrisons lived next door to us on Old Baltimore Road in Maryland. I recall little about his wife Phoebe as she passed away a short time after we arrived in Olney. Mr. Harrison lived in a sprawling colonial overrun with plants and books. There was an observatory in his backyard that housed a telescope. He often invited my brother and I over to peek through it and observe the stars. One night we even got to see a comet. After his wife died, he and my parents became good friends. Mr. Harrison was a former RAF pilot. 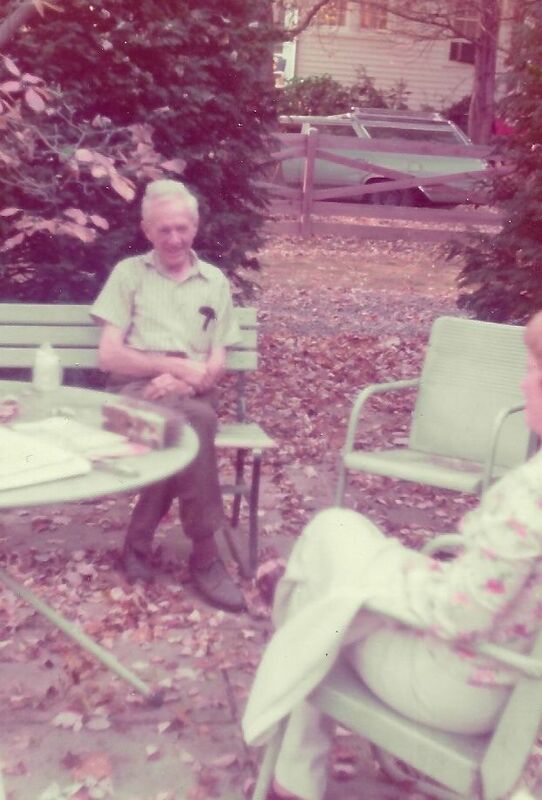 He was tall, with thick white hair and a lovely, craggy, angular face (pictured at left with Mom in the early ’70s). I was certain that in his time he must have made a dashing pilot. But I actually got to know Mr. Harrison through letters he sent our family after we left Maryland in 1971. Three addressed to me are extant, with the first on June 2, 1978, after I’d invited him to my high school graduation. He recommended I read Stevenson’s Virginibus Puerisque, and gave tips on things to do and places to see in Britain. The letters were thoughtful, painstakingly well-written, with corrections in the margins as needed. It’s likely he meant “Happy landings!” but for the longest time I thought it was some mysterious Anglo catchphrase, like Cockney rhyming slang or street banter entirely unfamiliar to me. I don’t know when Mr. Harrison went to join his beloved wife, but I often think of him. I’ll never forget his kindnesses to our family, and his eagerness to help a neighbor kid who desired to become a writer. ~ by completelyinthedark on December 5, 2010.